Berlin is once again facing violent clashes from left-wing extremists who have thrown rocks at police during a demonstration against the migrant policy of the federal government. Meant to be a protest against the migrant policies of Chancellor Angela Merkel’s federal government, the “Blockupy” protest in Berlin started with violent clashes between left-wing extremists and police. Extremists dressed purely in black are said to have sought out confrontations with police and threw rocks and other objects at the officers. The police responded with pepper spray and have since made several arrests reports Die Welt. According to police most of the violence came from demonstrators in the Potsdam square in Berlin. The group actively engaged the officers by throwing rocks at them, lighting off fireworks in their direction and shouted various slogans and insults at them. Some protesters also tried to fight with some police in an attempt to break free of a cordon that was meant to prevent them interacting with any counter-protesters. The extremists were met with force by police who utilized pepper spray to disperse them and end the attack. Although there was clear evidence of violence on behalf of the demonstrators, the spokeswoman for the police claimed that the event was mostly peaceful. 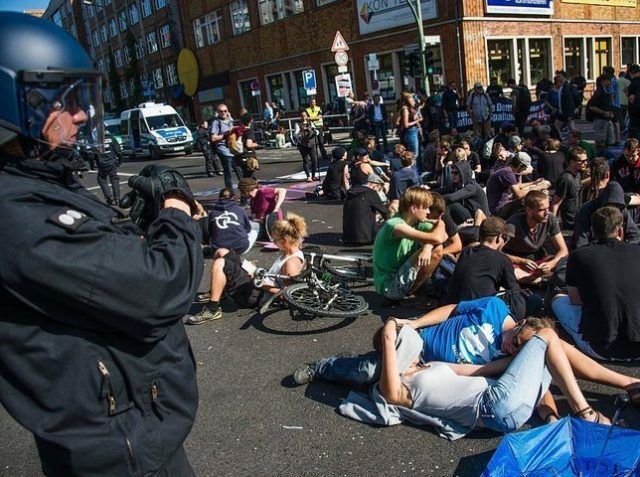 While many of the protesters were attacking police, some staged a sit-in to voice their opinions about the federal government’s migrant policy and the new integration act. The Blockupy group claim that the federal government is exploiting the migrants who have flooded into Germany in the past year and that the integration act is unfair because the migrants shouldn’t have to integrate. Police have said they will be vigilant to monitor the event for more violent actions as it goes from Friday and ends on Sunday. The authorities announced that they would employ 1200 police to keep order during the event, shipping in officers from the regions of Hesse, North Rhine-Westphalia, Mecklenburg-Vorpommern, Rhineland-Palatinate and Lower Saxony. Left-wing violence in Berlin erupted earlier this year when police attempted to evacuate a building on Berlin’s Riga street. The building had been occupied by leftists for years and when the new owner wanted to turn it into a migrant home the leftists reacted with violence against police, burning of cars and smashing of local businesses. German police continue to worry and warn about the rise in leftist violence. Thomas Rath, Chief of the Göttingen police forces expressed utter shock at the level of left-wing violence toward his officers, saying that many of the protesters view the police as the enemy.